A data assimilation scheme was developed to improve snow water equivalent (SWE) simulations by updating meteorological forcings and snowpack states using passive microwave satellite observations. A chain of models was first calibrated to simulate satellite observations over northeastern Canada. The assimilation was then validated over 12 stations where daily SWE measurements were acquired during 4 winters (2012–2016). 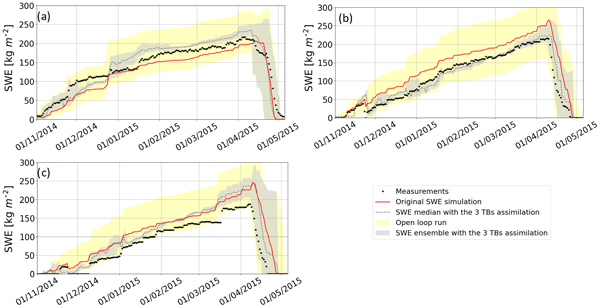 The overall SWE bias is reduced by 68 % compared to original SWE simulations. To improve microwave satellite and airborne observation products in forest environments, a precise and reliable estimation of the permittivity of trees is required. We developed a probe suitable to measure the permittivity of tree trunks at L band in the field. The system is easily transportable in the field, low energy consuming, operational at low temperatures and weatherproof. The permittivity of seven tree species in both frozen and thawed states was measured, showing important contrast. Since 2009, the ultra-wideband snow radar on Operation IceBridge has acquired data in annual campaigns conducted during the Arctic and Antarctic springs. Existing snow depth retrieval algorithms differ in the way the air–snow and snow–ice interfaces are detected and localized in the radar returns and in how the system limitations are addressed. Here, we assess five retrieval algorithms by comparisons with field measurements, ground-based campaigns, and analyzed fields of snow depth. We developed a global land parameter data record (LPDR; 2002–2015) using satellite microwave observations. The LPDR algorithms exploit multifrequency microwave observations to derive a set of environmental variables, including surface fractional water, atmosphere precipitable water vapor, daily surface air temperatures, vegetation optical depth, and volumetric soil moisture. The resulting LPDR shows favorable accuracy and provides for the consistent monitoring of global environmental changes. Multiband thermal measurements of zenith sky radiance were used in a retrieval algorithm, to estimate cloud optical depth and effective particle diameter of thin ice clouds in the Canadian High Arctic. The retrieval technique was validated using a synergy lidar and radar data. Inversions were performed across three polar winters and results showed a significant correlation (R2 = 0.95) for cloud optical depth retrievals and an overall accuracy of 83 % for the classification of thin ice clouds. A new freeze–thaw (FT) Earth system data record (ESDR) was developed from satellite passive microwave remote sensing that quantifies the daily landscape frozen or non-frozen status over a 25 km resolution global grid and 1979–2014 record. The FT-ESDR shows favorable accuracy and performance, enabling new studies of climate change and frozen season impacts on surface water mobility and ecosystem processes. Radio-frequency interference (RFI) can significantly contaminate the measured radiometric signal of current spaceborne L-band passive microwave radiometers used for monitoring essential climate variables. A 385-channel hyperspectral L-band radiometer system was designed with the means to quantify the strength and type of RFI. The compact design makes it ideal for mounting on both surface and airborne platforms to be used for calibrating and validating measurement from spaceborne sensors. A new automated method for microwave satellite assessment of lake ice conditions at 5 km resolution was developed for lakes in the Northern Hemisphere. The resulting ice record shows strong agreement with ground observations and alternative ice records. Higher latitude lakes reveal more widespread and larger trends toward shorter ice cover duration than lower latitude lakes. The new approach allows for rapid monitoring of lake ice cover changes, with accuracy suitable for global change studies. We present an approach of satellite remote sensing to derive a continuous long term and stable data record of the near-surface freeze/thaw cycle over the permafrost and seasonally frozen ground. We find that the distribution of the frost days and its trend variations are consistent with the minimum temperature anomalies. Analysis over the Qinghai-Tibetan Plateau demonstrates that the frost period is shortening slightly over the past decade, and the last frost date is advanced in most regions. Productivity of the vegetation of northern Eurasia has been found to be increasing over the last few decades. Using statistical tools we investigate major factors driving the increase in photosynthetic activity. Most of this change is explained by rising temperatures, which drive an increase in productivity. However, the contribution of changing patterns of rainfall and cloudiness is also significant, especially in the southern parts of the region which exhibit higher drought vulnerability. Located at the far south (~62.5° N) of the Canadian Arctic, Grinnell and Terra Nivea Ice Caps are good climate proxies in this scarce data region. Multiple data sets (in situ, airborne and spaceborne) reveal changes in area, elevation and mass over the past 62 years. Ice wastage sharply accelerated during the last decade for both ice caps, as illustrated by the strongly negative mass balance of Terra Nivea over 2007-2014 (-1.77 ± 0.36 m a-1 w.e.). Possible climatic drivers are also discussed. Long-term observational data are available from the Samoylov research site in northern Siberia, where meteorological parameters, energy balance, and subsurface observations have been recorded since 1998. This paper presents the temporal data set produced between 2002 and 2017, explaining the instrumentation, calibration, processing and data quality control. The data are suitable for calibrating and quantifying the dynamics of permafrost as a component in earth system models. A 20-year data record from the Bayelva site at Ny-Ålesund, Svalbard, is presented on meteorology, energy balance components, surface and subsurface observations. This paper presents the data set, instrumentation, calibration, processing and data quality control. 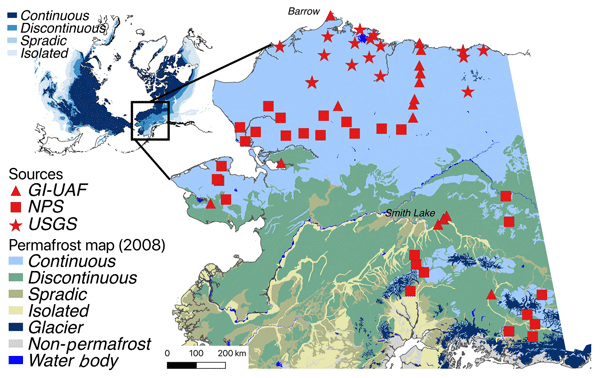 The data show that mean annual, summer and winter soil temperature data from shallow to deeper depths have been warming over the period of record, indicating the degradation and loss of permafrost at this site. We present detailed surface elevation measurements for the McMurdo Dry Valleys, Antarctica, and surroundings, derived from aerial lidar surveys flown in the austral summer of 2014–2015 as part of an effort to understand landscape changes over the past decade. Lidar return density varied from 2 to > 10 returns per square meter with an average of about 5 returns per square meter. vertical and horizontal accuracies are estimated to be 7 cm and 3 cm, respectively. Artemov, V. G. and Volkov, A. A.: Water and Ice Dielectric Spectra Scaling at 0 °C, Ferroelectrics, 466, 158–165, https://doi.org/10.1080/00150193.2014.895216, 2014. Barr, A., Black, T. A., and Mccaughey, H.: Climatic and Phenological Controls of the Carbon and Energy Balances of Three Contrasting Boreal Forest Ecosystems in Western Canada, in: Phenology of Ecosystem Processes, edited by: Noormets, A., Springer, New York, NY, 2009. 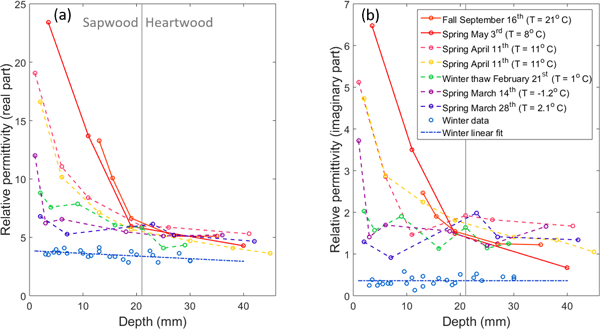 Black, T. A., Nesic, Z., Chen, Z., Chen, W. J., Barr, A. G., Arain, M. A., Neumann, H. H., and Yang, P. C.: Increased carbon sequestration by a boreal deciduous forest in years with a warm spring, Geophys. Res. Lett., 279, 1271–1274, 2000. Brodzik, M. J. and Knowles, K.: EASE-Grid 2.0 Land Cover Classifications Derived from Boston University MODIS/Terra Land Cover Data, Version 1, [Subset used: 36 km, all land classes], NASA National Snow and Ice Data Center Distributed Active Archive Center, Boulder, Colorado, USA, https://doi.org/10.5067/XR8523MC24TB, 2011. Brodzik, M. J., Billingsley, B., Haran, T., Raup, B., and Savoie, M. H.: Correction: Brodzik, M. J., et al. EASE-Grid 2.0: Incremental but Significant Improvements for Earth-Gridded Data Sets, ISPRS International Journal of Geo-Information 2012, 1, 32–45, ISPRS Int. J. Geo-Inf., 3, 1154–1156, https://doi.org/10.3390/ijgi3031154, 2014. Brucker, L., Dinnat, E. P., and Koenig, L. S.: Weekly gridded Aquarius L-band radiometer/scatterometer observations and salinity retrievals over the polar regions – Part 1: Product description, The Cryosphere, 8, 905–913, https://doi.org/10.5194/tc-8-905-2014, 2014. Brucker, L., Dinnat, E., and Koenig, L.: Aquarius L3 Weekly Polar-Gridded Brightness Temperature and Sea Surface Salinity, Version 5, [Subset used: Northern Hemisphere (NH), beam 1, 2 and 3], NASA National Snow and Ice Data Center Distributed Active Archive Center, Boulder, Colorado USA, https://doi.org/10.5067/Aquarius/AQ3_TB.005, 2015. Derksen, C., Xu, X., Scott Dunbar, R., Colliander, A., Kim, Y., Kimball, J. S., Black, T. A., Euskirchen, E., Langlois, A., Loranty, M. M., Marsh, P., Rautiainen, K., Roy, A., Royer, A., and Stephens, J.: Retrieving landscape freeze/thaw state from Soil Moisture Active Passive (SMAP) radar and radiometer measurements, Remote Sens. Environ., 194, 48–62, https://doi.org/10.1016/j.rse.2017.03.007, 2017. Gouttevin, I., Menegoz, M., Dominé, F., Krinner, G., Koven, C., Ciais, P., Tarnocai, C., and Boike, J.: How the insulating properties of snow affect soil carbon distribution in the continental pan-Arctic area, J. Geophys. Res., 117, G02020, https://doi.org/10.1029/2011JG001916, 2012. Gray, D. M., Landine, P. G., and Granger, R. J.: Simulating infiltration into frozen Prairie soils in streamflow models, Can. J. Earth Sci., 22, 464–472, 1984. Hallikainen, M. T., Ulaby, F. T., and Mohamed, A.: Dielectric Properties of Snow in the 3 to 37 GHz, IEEE T. Antenn. Propag., 34, 1329–1340, https://doi.org/10.1109/TAP.1986.1143757, 1986. IPCC: Climate Change 2014: Synthesis Report, Contribution of Working Groups I, II and III to the Fifth Assessment Report of the Intergovernmental Panel on Climate Change, edited by: Core Writing Team, Pachauri, R. K., and Meyer, L. A., IPCC, Geneva, Switzerland, 151 pp, 2014. Kim, Y., Kimball, J. S., McDonald, K. C., and Glassy, J.: Developing a global data record of daily landscape freeze/thaw status using satellite passive microwave remote sensing, IEEE T. Geosci. Remote, 49, 949–960, https://doi.org/10.1109/TGRS.2010.2070515, 2011. Kim, Y., Kimball, J. S., Zhang, K., and McDonald, K. C.: Satellite detection of increasing Northern Hemisphere non-frozen seasons from 1979 to 2008: Implications for regional vegetation growth, Remote Sens. Environ., 121, 472–487, https://doi.org/10.1016/j.rse.2012.02.014, 2012. Kim, Y., Kimball, J. S., Glassy, J., and Du, J.: An extended global Earth system data record on daily landscape freeze–thaw status determined from satellite passive microwave remote sensing, Earth Syst. Sci. Data, 9, 133–147, https://doi.org/10.5194/essd-9-133-2017, 2017a. Kim, Y., Kimball, J. S., Glassy, J., and McDonald., K. C.: MEaSUREs Global Record of Daily Landscape Freeze/Thaw Status, Version 4 [Subset used: SSMI_37V_CO_FT_xxxx_dayxxx_v04.h5], NASA National, Snow Ice Data Center Distributed Active Archive Center, Boulder, Colorado, https://doi.org/10.5067/MEASURES/CRYOSPHERE/nsidc-0477.004, 2017b. Kumar, N., Grogan, P., Chu, H., Christiansen, C. T., Walker, V. K., and Sciences, M.: The Effect of Freeze-Thaw Conditions on Arctic Soil Bacterial Communities, Biology, 2, 356–377,https://doi.org/10.3390/biology2010356, 2013. Kurganova, I., Teepe, R., and Loftfield, N.: Influence of freeze-thaw events on carbon dioxide emission from soils at different moisture and land use, Carbon Balance Manag., 9, 1–9, https://doi.org/10.1186/1750-0680-2-2, 2007. Langer, M., Westermann, S., Heikenfeld, M., Dorn, W., and Boike, J.: Remote Sensing of Environment Satellite-based modeling of permafrost temperatures in a tundra lowland landscape, Remote Sens. Environ., 135, 12–24, https://doi.org/10.1016/j.rse.2013.03.011, 2013. Lyu, H., McColl, K. A., Li, X., Derksen, C., Berg, A., Black, T. A., Euskirchen, E., Loranty, M., Pulliainen, J., Rautiainen, K., Rowlandson, T., Roy, A., Royer, A., Langlois, A., Stephens, J., Lu, H., and Entekhabi, D.: Validation of the SMAP freeze/thaw product using categorical triple collocation, Remote Sens. Environ., 205, 329–337, https://doi.org/10.1016/j.rse.2017.12.007, 2018. McColl, K. A., Roy, A., Derksen, C., Konings, A. G., Hamed, S., and Entekhabi, D.: Triple collocation for binary and categorical variables: Application to validating landscape freeze/thaw retrievals, Remote Sens. Environ., 176, 31–42, https://doi.org/10.1016/j.rse.2016.01.010, 2016. Peng, X., Frauenfeld, O. W., Cao, B., Wang, K., Wang, H., Su, H., Huang, Z., Yue, D., and Zhang, T.: Response of changes in seasonal soil freeze/thaw state to climate change from 1950 to 2010 across china, J. Geophys. Res.-Earth, 121, 1984–2000, https://doi.org/10.1002/2016JF003876, 2016. Poutou, E., Krinner, G., and Genthon, C.: Role of soil freezing in future boreal climate change, Clim. Dynam., 23, 621–639, https://doi.org/10.1007/s00382-004-0459-0, 2004. Rautiainen, K., Lemmetyinen, J., Pulliainen, J., Vehvilainen, J., Drusch, M., Kontu, A., Kainulainen, J. and Seppänen, J.: L-band radiometer observations of soil processes in boreal and subarctic environments, IEEE Trans. Geosci. Remote, 50, 1483–1497, https://doi.org/10.1109/TGRS.2011.2167755, 2012. Rautiainen, K., Lemmetyinen, J., Schwank, M., Kontu, A., Ménard, C. B., Mätzler, C., Drusch, M., Wiesmann, A., Ikonen, J., and Pulliainen, J.: Detection of soil freezing from L-band passive microwave observations, Remote Sens. Environ., 147, 206–218, https://doi.org/10.1016/j.rse.2014.03.007, 2014. Rautiainen, K., Parkkinen, T., Lemmetyinen, J., Schwank, M., Wiesmann, A., Ikonen, J., Derksen, C., Davydov, S., Davydova, A., Boike, J., Langer, M., Drusch, M., and Pulliainen, J.: SMOS prototype algorithm for detecting autumn soil freezing, Remote Sens. Environ., 180, 346–360, https://doi.org/10.1016/j.rse.2016.01.012, 2016. Rowlandson, T., A. Berg, A., Roy, A., Kim, E., Pardo Lara, R., Powers, J., Lewis, K., Houser, P., McDonald, K., Toose, P., Wu, A., De Marco, E., Derksen, C., Entin, J., Colliander, A. and Xu Xiaolan: Capturing Agricultural Soil Freeze/Thaw State through Remote Sensing and Ground Observations: A Soil Freeze/Thaw Validation Campaign, Remote Sens. Environ., 211, 59–70, https://doi.org/10.1016/j.rse.2018.04.003, 2018. Roy, A., Royer, A., Derksen, C., Brucker, L., Langlois, A., Mialon, A., and Kerr, Y. H.: Evaluation of Spaceborne L-Band Radiometer Measurements for Terrestrial Freeze/Thaw Retrievals in Canada, IEEE J. Sel. Top. Appl., 8, 4442–4459, https://doi.org/10.1109/JSTARS.2015.2476358, 2015. Roy, A., Id, P. T., Derksen, C., Rowlandson, T., Berg, A., Lemmetyinen, J., Royer, A., Tetlock, E., Helgason, W., and Sonnentag, O.: Spatial Variability of L-Band Brightness Temperature during Freeze/Thaw Events over a Prairie Environment, Remote Sens., 9, 1–16, https://doi.org/10.3390/rs9090894, 2017a. Roy, A., Brucker, L., Prince, M., Royer, A., and Derksen, C.: Aquarius L3 Weekly Polar-Gridded Landscape Freeze/Thaw Data, Version 5, NSIDC: National Snow and Ice Data Center, Boulder, Colorado USA, https://doi.org/10.5067/OV4R18NL3BQR, 2018. Roy, A., Toose, P., Williamson, M., Rowlandson, T., Derksen, C., Royer, A., Berg, A. A., Lemmetyinen, J., and Arnold, L.: Response of L-Band brightness temperatures to freeze/thaw and snow dynamics in a prairie environment from ground-based radiometer measurements, Remote Sens. Environ., 191, 67–80, 2017b. Schaefer, K., Zhang, T., Bruhwiler, L., and Barrett, A. P.: Amount and timing of permafrost carbon release in response to climate warming, Tellus B, 63, 165–180, https://doi.org/10.1111/j.1600-0889.2011.00527.x, 2011. Schwank, M., Stähli, M., Wydler, H., Leuenberger, J., Mätzler, C., Member, S., and Flühler, H.: Microwave L-Band Emission of Freezing Soil, IEEE T. Geosci. Remote, 42, 1252–1261, 2004. Panneer Selvam, B., Laudon, H., Guillemette, F., and Berggren, M.: Influence of soil frost on the character and degradability of dissolved organic carbon in boreal forest soils, J. Geophys. Res.-Biogeo., 121, 829–840, https://doi.org/10.1002/2015JG003228, 2016. Ulaby, F. T., Moore, R. K., and Fung, A. K.: Microwave remote sensing: active and passive, Volume III: From Theory to Applications, Remote Sen., Artech House, Inc., 1986. Shi, J., Dong, X., Zhao, T., Du, Y., Liu, H., Wang, Z., Zhu, D., Xiong, C., Jiang, L., Shi, J., and Dong, X.: The Water Cycle Observation Mission (WCOM): Overview, in: 2016 IEEE International Geoscience and Remote Sensing Symposium (IGARSS), Beijing, China, 10–15 July 2016, IEEE, 3430–3433, https://doi.org/10.1109/IGARSS.2016.7729886, 2016. Wigneron, J., Jackson, T. J., Neill, P. O., Lannoy, G. De, Rosnay, P. De, Walker, J. P., Ferrazzoli, P., Mironov, V., Bircher, S., Grant, J. P., Kurum, M., Schwank, M., Munoz-sabater, J., Das, N., Royer, A., Al-yaari, A., Bitar, A. Al, Fernandez-moran, R., Lawrence, H., Mialon, A., Parrens, M., Richaume, P., Delwart, S., and Kerr, Y.: Modelling the passive microwave signature from land surfaces? : A review of recent results and application to the L-band SMOS & SMAP soil moisture retrieval algorithms, Remote Sens. Environ., 192, 238–262, https://doi.org/10.1016/j.rse.2017.01.024, 2017. Xu, L., Myneni, R. B., Iii, F. S. C., Callaghan, T. V, Pinzon, J. E., Tucker, C. J., Zhu, Z., Bi, J., Ciais, P., Tømmervik, H., Euskirchen, E. S., Forbes, B. C., Piao, S. L., Anderson, B. T., Ganguly, S., Nemani, R. R., Goetz, S. J., Beck, P. S. A., Bunn, A. G., Cao, C., and Stroeve, J. C.: Temperature and vegetation seasonality diminishment over northern lands, Nat. Clim. Change, 3, 581–586, https://doi.org/10.1038/nclimate1836, 2013. Zheng, D., Wang, X., van der Velde, R., Zeng, Y., Wen, J., Wang, Z., Schwank, M., Ferrazzoli, P., Member, S., and Su, Z.: L-Band Microwave Emission of Soil Freeze – Thaw Process in the Third Pole Environment, IEEE T. Geosci. Remote, 55, 5324–5338, 2017.